I’m sitting in a restaurant late in the evening after giving a talk at the San Simon University of Cochabamba, Bolivia, student body 80,000. I’m amazed that what I’ve been seeing here and, just a few days earlier in Colombia, fits so well with what I was thinking about writing about for this issues of our newsletter, that is, good news: the progress toward ecocities in the last few years. Yes I know we are still – and rather massively – loosing ground to cars and asphalt in the developing world and the move toward seriously curbing greenhouse gasses in the United States and China is glacial. But some serious idea seeds and vigorous sprouts abound. I’m heartened by the overflow crowd for my talk an hour ago here at the University, and back in Bogota just three days earlier, the day I spoke there was “Car Free Day.” Thousands of mostly young people gathered in the main square in front of the Mayor’s office listening and dancing to reggae music; there must have been two bicycles for every three persons. I’d never seen so many bicycles and such an expression that – hey! – this is totally normal! A rare few carped it had taken longer to get about town. Of course! The city was transformed for the car driver, not the driver him or her self. Generally the citywide event sparked enormous enthusiasm for not having to deal with cars. Fresh air, blue sky, sunshine and no tension among giant hurtling steel beetles, no loud chaotic noise and acrid airs. 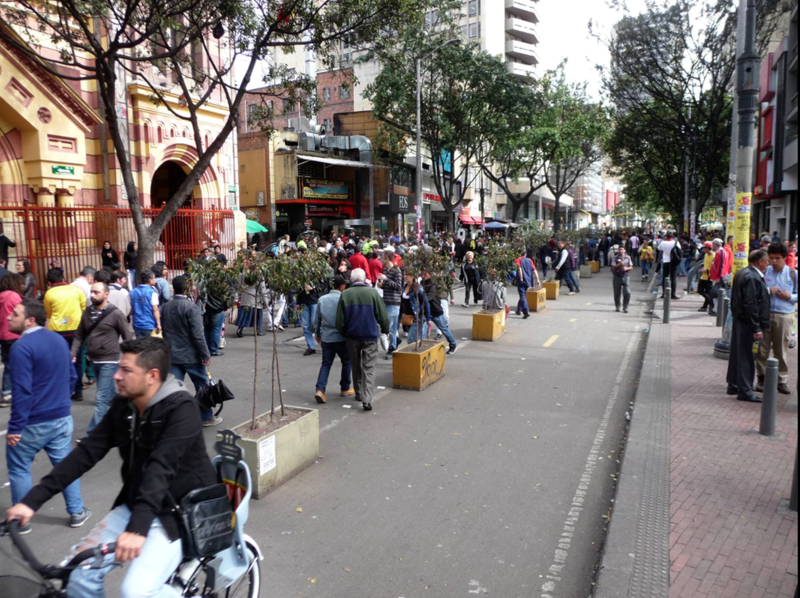 Car free street in Bogota. In the whole city no private cars were supposed to move, and in fact I saw none, until, as planned, after sunset. The air over the entire city was unusually fresh, the hiss and rumble of traffic gone except for the occasional taxi and bus. Many streets were blocked off entirely, even to the taxis and off limits to the busses. Bicycles swarmed and collected at street locations and plazas and stopped for free music, bands, jugglers and dancing. I’d been thinking for an “article” I’d simply submit a list of the random advances, maybe even alphabetically arranged to let others than me decide the order of importance or some sort of categorical arrangement, omitting the “t” in “the.” I also thought our editor, Kirstin Miller and others working in our office might like to brainstorm and add some of those inspiring tidbits or true grand advances. Meantime life has gotten a little more interesting so I feel constrained to write some of what I’m up to that also constitutes good news, that is, fits the theme. I was speaking at the Meeting of the Americas Against Climate Change in Bogota hosted by the Mayor Gustavo Petro at the conference hall and facilities comprising part of the City Hall complex. These facilities are built around an interior plaza with big sculpture humming bird reigning over the enclosed gardens and pathways there. It was a real honor being invited to present in this place, first plenary talk on the second day of the conference, and the next day at the Bogota Archives, with an emphasis on ecocities in relation to waters. I could even say it was something of a dream come true in that I’d been working since the early 1980s trying to bring climate change into city planning, ultimately for promoting ecocities. I was trying to influence the political process that might actually end up in rezoning cities and towns for a full-on design revolution. The object of my affection at the time was Berkeley, California, my hope to give Berkeley the lead in confronting climate change. 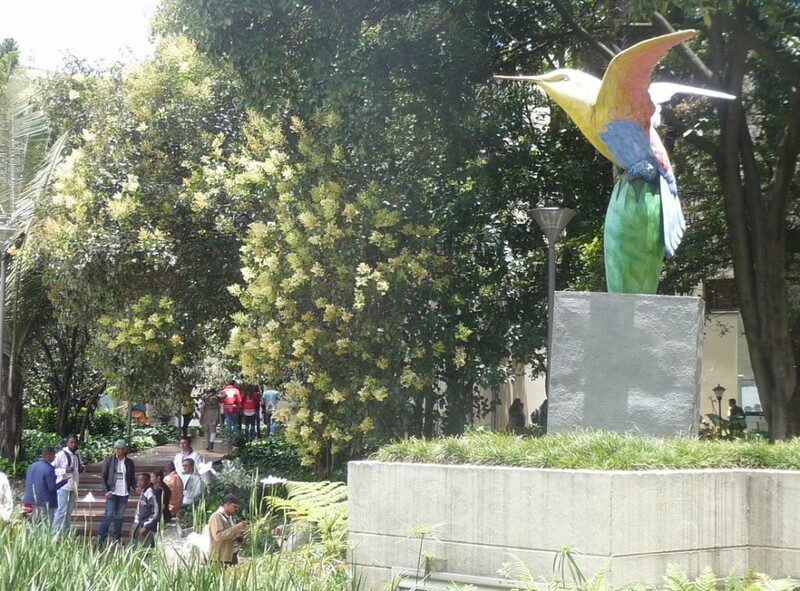 Humming bird reigns over the interior plaza of the City Hall complex of Bogota. In those days my climate change heroes, real Paul Revere scientists leading the charge, were Steven Schneider of Stanford and James Hansen of NASA’s Space Sciences Center. I was collecting their papers and funneling them to Berkeley Mayor Loni Hancock who was alert to the issue. She even had my ecocity zoning map on the wall next to her desk. The map was designed as a guide to help reshape cities for creek restoration, expansion of community gardens, orchards and parks and densification with diversification in the downtown, a West Berkeley Center, once called Ocean View and a South Berkeley Center, Lorin in the old days. That was around 1985. 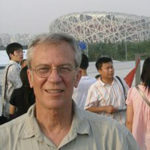 Despite all efforts of a small non-profit – ours – few connected city layout and design to climate change. The idea didn’t spread for a long time. Strange considering cities are the largest things humans create… But now people are beginning to make that connection. Mayor Petro’s initiative, though a little unusual, is no longer unique. Music to my ears – people are at last beginning to catch on. 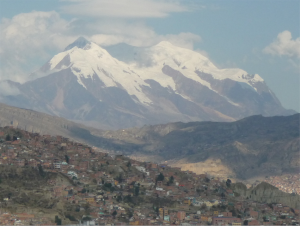 My first view of Illimani was from a tall building in La Paz. The city outskirts can be seen bottom left in the photograph. 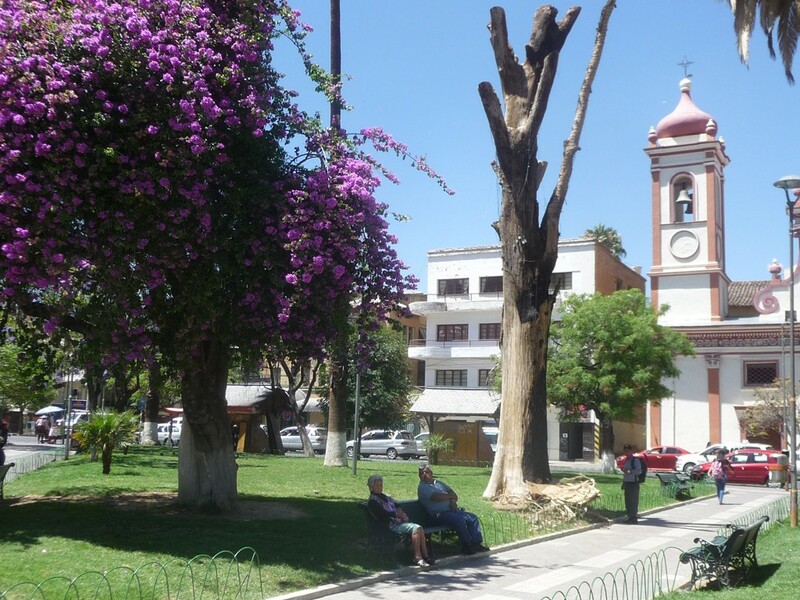 In the main plaza of Cochabamba a purple-pink bougainvillea vine growing up a trees has survived while its support tree has died decades ago, the vine turning into a free standing tree 200 years old. Never have I had so many back-to-back talks, tours and meetings with people of influence as in La Paz and Cochabamba – city mayors, senators, representatives to the national governments, professors, environmentalists, architects, city planners, biologists and hundreds of students. I found that officials in La Paz have already a polycentric city design model for their future city that fits with our “ecotropolis” and ecocity mapping concepts in the ecocity movement, and taking a ride almost the whole length of La Paz through the air in the Teleferico gondolas reinforced my sense that they are connecting together public transport with such a polycentric (ecotropolis) model for the city. In Cochabamba Renaldo and I met with Mayor Humberto Sanchez of a district of the larger Cochabamba city, a smaller city called Secaba, which is already dedicated to building a model of ecocity development on 72 hectares on the edge of town, a project that aspires to be a full-on model of ecocity design. Also meeting with us was a crew of several others already on a design team to pursue that objective and the State Senators to the National Parliament Ciro Zabala and Carola Arraya. Says Ciro Zabala, the State Government has already allocated $100 million US for a project that could be at the center of the new ecotown, money for a knowledge city core for healthy science and technology and a financial engine for the ecocity project. The signs look awfully good. Such a project could become the ecocity university town, a school in a thorough-going ecocity design that I have long thought so needed. 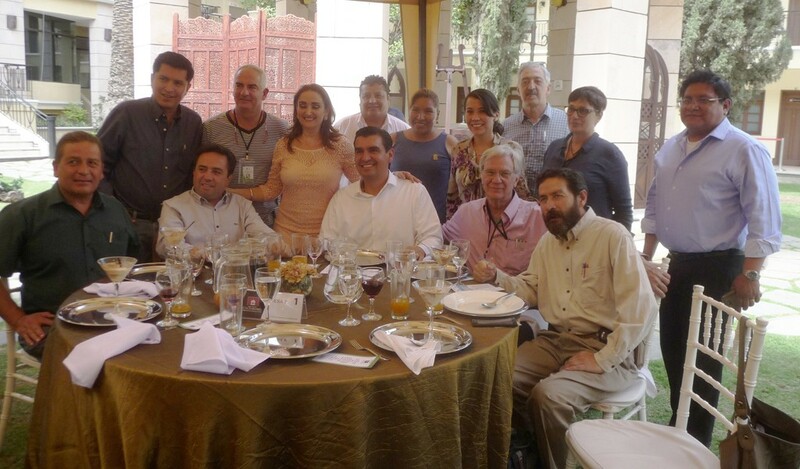 Ceremonial lunch for the 9th Seminario Kanata at the Tiquipaya Architectura Campus with Mayor of Cochabamba Jose Maria, in white sitting center, I’m in pink to the right and right of me is Reynaldo Cuadros with dark beard, the organizer of my tour and my translator for seven days, and also founder of the non-governmental organization (NGO) Biofera-dharma Foundation. The host organization was the Architecture College at the Tiquipaya Campus. I greet my first glacier, 16,500 feet above (rising) sea level. 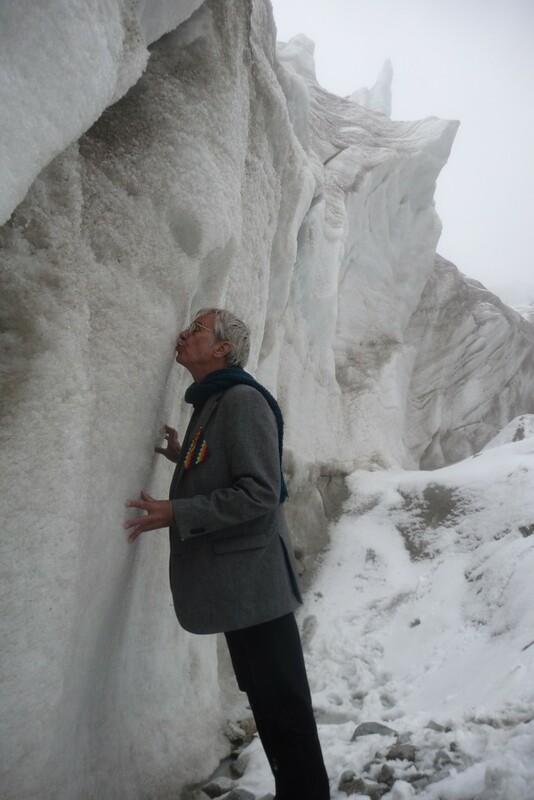 In addition to the speaking, planning and politicing, I climbed to my first encounter with a glacier at about 16,000 feet on a mountain called Huayna Portosi and heard from my new friends that this and all the other glaciers of their country have been melting rapidly over the last two or three decades. The only ski lift in the country was on the adjacent slope to our hiking route. Now no snow. It’s closed. Looking out at that beautiful massive mountain Illimani, my first introduction to the Bolivian volcanoes resplendent in radiant white it was love at first sight. But hearing at the same time that the white was rapidly shrinking up and away, ever higher and smaller, it was a most difficult and heart breaking experience. “Were those glaciers I see over there descending their valley much farther in the past, the snowline much lower?” “Yes.” Enough said. So now the race is on, between the absurd and the profound, one side the throw back to the days of mobility for it’s own sake and cheap thrills with no thought to the future, the car city, overmobility and reflexive desire for quick gratification in speed. On the other hand, most of what we stand for in calling for access by proximity: the shortest distance between points is designing them close together: that is, ecocity design, could make a profound positive difference, a rescue of the luminous mountain snows. Oddly, the idea of the scattered city of people trying to get away from the city to the suburbs was actually the first wave of ecocity efforts, just severely mislead. I call it the “ecocity impulse,” the impulse to have the city and the country at the same time. The problem was the means of delivery: the car, gasoline, asphalt and concrete. Then there is the contradiction: that sprawl development covered over nature and drove it yet farther from the city rather than creating a natural way of living in the supposed (but now extripated) country. To those growing up in a world of suburbs (and gasoline addiction, paving paradise, air pollution, climate change, species displacement and extinction and grinding accidents costing over one million human lives a year and many more innocent bystander fatalities… Why not smaller footprint cities and just bicycling or walking out through close-in city limits and into real nature? A statue of Jesus Christ stand on a high hill overlooking Cochabamba below. We know the mass of society is still on Plan A, the business as usual plan put forward by economists and those trying to maximize return on investment, the plan that sees infinite growth on a finite planet as ultimate measure of health and those who like Lester Brown have called for the Plan B in his books by that name that realize and take very seriously that we have to profoundly change our approaches. In that change, change toward ecocities can help lead us to understanding and building for limits to growth and design for the optimum built human environment and ultimately a future of opportunity and health for all, including the natural animals and plants. 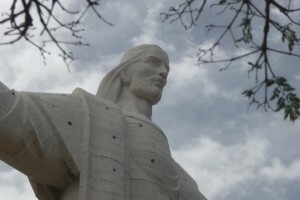 Maybe Bolivia will be a breakthrough. I proposed four specific steps that might just do that, and there was considerable interest expressed in working vigorously toward actualizing such steps. I call the idea the World Ecocity Leadership Package. Implementation in one or several cities the “polycentric” centers of development I learned were already writing into La Paz long term city plan, a mapping that looks approximately identical to our ecocity zoning maps in Ecocity Builders. Publishing of my books in Spanish for the Spanish-speaking world in Bolivia within the next year. Sounds self-serving but I can’t help but note how much having books in print have helped spread the word and influence practice in China. Establish an Ecocity University or College in a full-on ecocity designed community in Bolivia. 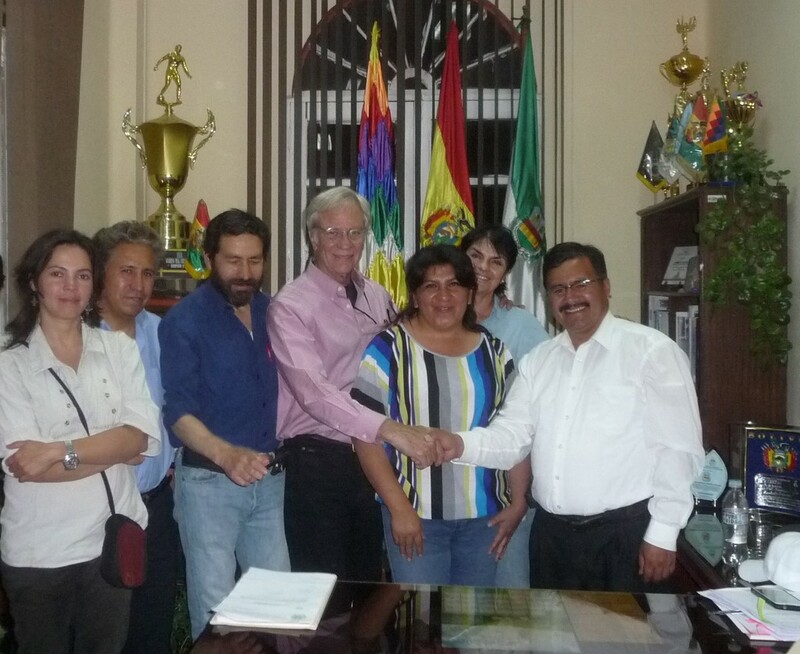 Make a powerful bid from a Bolivian city for hosting an International Ecocity conference, thus in three or for years, after much progress here, providing a world focus on ecocities in the land of celebrating – officially even – Mother Earth. Now here below is my list to read and meditate on, alphabetically ordered as any attempt to order according to importance or where to put helpful effort first is just too complicated to break down. You, dear readers, might have some such positive changes you’d like to site. Send them in to me and I’ll add them to my list. So, as a start, the changes in the right direction cited above are the beginning of my continued list below. We can count some blessings! And on and on……………………………. ………… …… …. … … .. . . . . . .